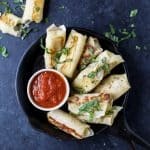 Skinny Baked Mozzarella Sticks wrapped in wonton wrappers, filled with gooey cheese, baked until golden brown and served with marinara sauce. Spray a large baking sheet with non-stick cooking spray. To a small bowl, add egg white, water, garlic powder, basil, oregano and parsley. Using a fork, lightly beat it and set it aside. Working with one wonton wrapper at a time, brush the edges with a light coating of egg wash.
Place a piece of cheese in the middle and fold in the sides. Fold the top over and roll toward the opposite end. Press to seal all edges. Try to make sure there is no openings so the cheese doesn’t ooze out. Place the prepared mozzarella sticks on the prepared baking sheet and repeat until all the cheese is wrapped. Lightly brush the top of each mozzarella stick with egg wash.
Place baking sheet on the bottom rack in oven and bake for 5 minutes. Remove from the oven, flip the mozzarella sticks and place back in the oven for an additional 2-3 minutes or until golden brown and crispy. Garnish with fresh basil and serve with marinara sauce.